Robots, AI deserve First Amendment protection. C-3PO may have important things to say. The First Amendment protects the reporter who examines the campaign donations to each U.S. representative and then calculates the open-market value of their votes in Congress. It also covers the artist who paints a mural tying specific state legislators to lax environmental regulations that caused the deaths of children. But what if C-3PO wrote that story? He’s “fluent in over 6 million forms of communication”—can the federal government prohibit his speech in all of them? What if C-3PO painted the mural—can the state government stop his tortured artistic soul from breaking through his bright and shiny exterior? There are already active concerns about how the First Amendment protects reporters who use drones. In multiple incidents recently, police arrested or intimidated a reporter who used a drone to review an accident scene. The reporters argue that because they are using the drones to observe police activity from a public space as part of a news story, the drone activities are protected under the First Amendment. Police, meanwhile, have claimed that they have stopped drones or arrested reporters because of legitimate safety concerns—for instance, in one case, they said that a journalist’s drone interfered with a helicopter approaching an accident scene. C-3PO’s First Amendment claim is different. First, he would never run into an accident scene willingly—if he’s there, it’s only because R2-D2 pushed him there, in which case, the police should arrest that droid. 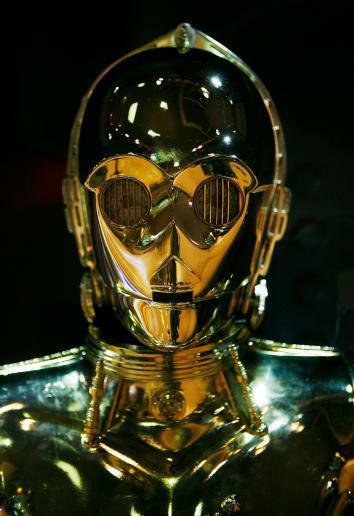 Second, C-3PO isn’t a tool someone uses to engage in self-expression—he creates and expresses ideas all his own. Does the First Amendment apply to robots? Similarly, Wired recently ran a story about a start-up that is attempting to create imaginative AI. If that technology is successful and combined with drones like KATSU’s, or with writing programs like the ones created by Automated Insights and Narrative Science, there is the serious potential for art, music, and commentary that is offensive, thought-provoking, and possibly even dangerous in the same way that human-created art, music, and commentary have been forever. In that case, local, state, and federal governments may want to limit robot speech. In 1913, Florida enacted a law that required newspapers to give equal space to the opponents of the candidates the papers endorsed. It was good law until the U.S. Supreme Court found it unconstitutional in 1974. In 1927, Minnesota enacted a law that permitted courts to shut down a newspaper viewed as “malicious, scandalous and defamatory.” The Supreme Court found it unconstitutional in 1931. In 1932, the Los Angeles City Council passed an ordinance that criminalized the distribution of anonymous pamphlets. It was an actively enforced law until the Supreme Court found it unconstitutional in 1960. But the fact is that robots, computer programs, and AI deserve the same free speech protections as humans. The Constitution doesn’t differentiate between human and machine speech; it only provides for free speech. Admittedly, if you go looking for further legal justification for protecting robot speech, you are unlikely to find it. To the best of my knowledge, there is no statute, ordinance, or case law that affirmatively protects AI expression. But that is only because AI and autonomous technology are too new for those laws to exist yet. That is why so many states are scrambling to enact laws that govern self-driving cars: legislators know their states’ existing laws don’t govern them. It is important to recognize that the First Amendment does not limit its protection to human beings. Without that protection, it will only be a matter of time before towns, states, and Congress pass laws that restrict robot speech, limiting how machines can contribute new and worthwhile ideas. Until creative AI is given a greater and constitutionally protected chance to express itself, we can’t know how useful ideas from droids like C-3PO may be. These could be the droids we’re looking for.